Masterclass with Amy Sherman-Palladino We are now LIVE with our Woman of the Year Amy Sherman-Palladino! Join us for a Masterclass led by female showrunners within NYU Tisch's Film and TV program. Fusion Film Festival was live. Masterclass with Amy-Sherman Palladino We're LIVE with our Woman of the Year, Amy Sherman-Palladino! Tune in for her Masterclass led by female showrunners within NYU Tisch's Film and TV classes. 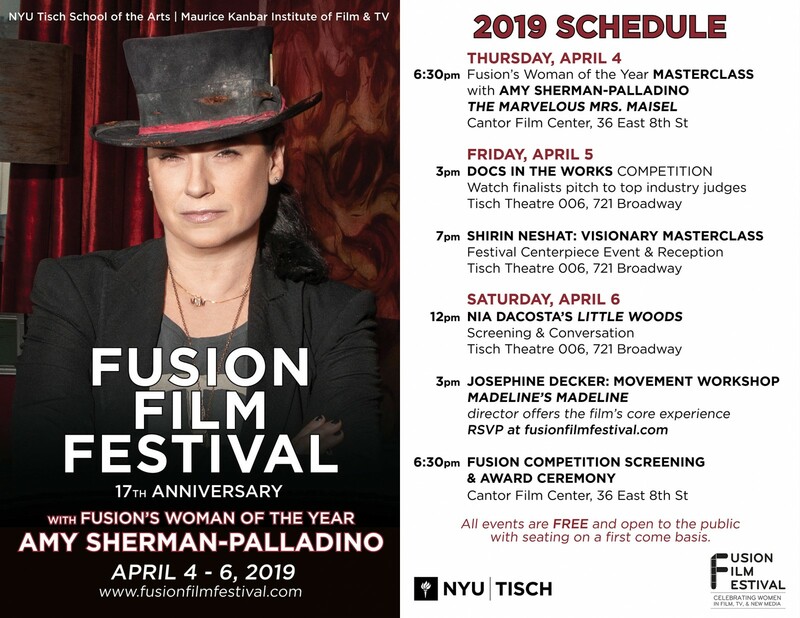 🚨BREAKING NEWS: FUSION’S WOMAN OF THE YEAR MASTERCLASS with AMY SHERMAN-PALLADINO has been RE-SCHEDULED to tomorrow, Friday, April 5th at 7 PM in the Cantor Film Center. Spread the word! Check out this amazing short doc on Shirin Nashat to learn more about her work and voice before the festival this weekend! Little Woods [Official Trailer] In Select Theaters April 19 Don't miss our exciting screening of LITTLE WOODS, starring Tessa Thompson and Lily James, followed by a Q&A with director Nia DaCosta! Join us this Saturday at 12pm in Tisch Theater 006. The 2019 Fusion Film Festival begins this Thursday! Amy is the showrunner, creator, and director of the beloved shows GILMORE GIRLS and THE MARVELOUS MRS. MAISEL. She's won multiple Emmy Awards for her work and is a huge inspiration to female filmmakers everywhere! Creator of the beloved Gilmore Girls and the critically-acclaimed The Marvelous Mrs. Maisel, Amy Sherman-Palladino will be joining us in ONE WEEK for a masterclass as our Woman of the Year! Don't miss out- come to Cantor Film Center next Thursday at 6:30pm. Fusion Film Festival updated their cover photo. Desiree Akhavan Masterclass Our masterclass with Desiree Akhavan is TODAY! Join us for a conversation with the award-winning director at 6:30 in Tisch. Read up on Desiree Akhavan, writer and director of The Miseducation of Cameron Post and HULU's The Bisexual, then join us for a conversation and masterclass with her on TUESDAY night! 's cover photo Fusion Film Festival updated their cover photo. 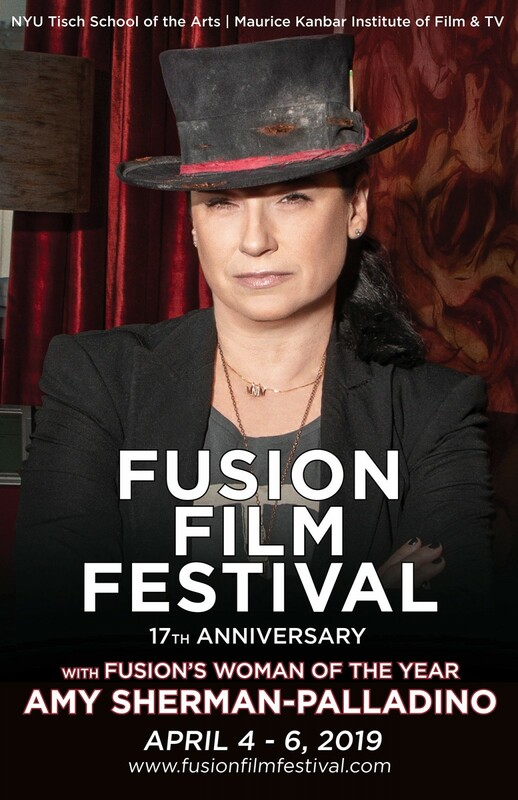 The Fusion Film Festival Through our diverse and rich programming we shine light on female filmmakers from iconic artists to thrilling work by students. Your support for Fusion Film Festival 2019 will empower tomorrow's female filmmakers and storytellers! Donate today and claim some great perks! Help NYU Rising Violets raise $8,000 for the project: The Fusion Film Festival. Your gift will make a difference! Today is the LAST DAY to submit to this year's festival! Put those finishing touches on your project and submit by tonight! Here's a shot from last year's winner for graduate film, "Shelter," directed by Na’ama Keha. Submissions for this year's Fusion Film Festival close in ONE WEEK! Share your story and win amazing prizes, including the Canon 5D Mark IV. TONIGHT is your chance to catch a free screening of DESTROYER, followed by a student-moderated Q&A with director Karyn Kusama. Join us at 7pm in Cantor Film Center! DESTROYER | Official Trailer DESTROYER is "a tremendous piece of filmmaking, fueled by Kusama's fearless creative vision and Kidman's transformative performance." Join us tomorrow for a free screening at 7pm in Cantor Film Center, followed by a Q&A with the director. 1 DAY until our launch event! Learn how you can submit your work to Fusion Film Festival. Our submissions launch event is THIS Friday! 3 DAYS until our launch event! Don't miss the chance to learn about submissions for this year's festival! Hey everyone, thank you to everyone who has applied to be a 2018-19 member of Fusion. You will be notified shortly about the status of your application! FFF18: Student Showcase & Awards Ceremony A stunning showcase screening of the finalists in the 2018 Fusion Film Festival Competition. Fusion Film Festival added 5 new photos — at Fusion Film Festival. FFF18: Masterclass with The Queer Producers Collective Conversation with members of this open peer-to-peer network of distinguished producers with a diverse range of experiences and identities. Congratulations to our 2018 opening night film @realboymovie for being nominated for a GLAAD award! Check out the trailer below in case you missed the screening. FFF18: Women in New Media Highlighting the work of innovative artists who share their stories through podcasts, virtual reality, YouTube, and other new media platforms. Fusion Film Festival added 9 new photos — at Fusion Film Festival. That’s all for now everyone! Check out our other platforms for photos and more stories. Thank you! This is your Co-Head of Marketing, Symphony Bue and today I will be sharing my experience at the Cobra Kai screening at the Tribeca Film Festival today on behalf of our sponsors, The Will and Jada Smith Family Foundation. Stay tuned! FFF18: Real Talk These successful women shared their insight on breaking into the industry, finding opportunities, and navigating your career. Moderated by Fusion Film Festival honoree Karen Horne of NBC. Featuring Radha Blank, Audrey Esparza, Yvette Miley, Amber Payne, and Foluke Tuakli. Fusion Film Festival added 7 new photos — at Fusion Film Festival. FFF18: Brunch with Karen Horne of NBC Fusion was incredibly honored to have NBC Universal’s Senior VP of Programming Talent Development & Inclusion, Karen Horne, for our Brunch with a Changemaker. In her role, Karen oversees all of NBC Universal’s incredible TALENT INFUSION PROGRAMS. Fusion Film Festival added 6 new photos — at Fusion Film Festival. FFF18: Docs In The Works Finalists presented their works-in-progress to top industry judges for feedback and the chance to win an amazing prize that will help them finish their documentary! Fusion Film Festival added 10 new photos — at Fusion Film Festival. FFF18: Artists & Activists Influential filmmakers who use their art to inspire social and political change. Featuring Brittany "B.Monét" Fennell, Madeleine Sackler, Nancy Schwartzman, Nneka Onuorah, Erin Lee Carr, and moderated by Raeshem Nijhon. Fusion Film Festival added 12 new photos — at Fusion Film Festival. Congrats to all the finalists & winners and thank you to everyone who made #fusion2018 such a success! Wanna know what has all these people waiting outside in the cold? Come to Fusion’s Competition Screenings & Awards Ceremony, our FINAL event! The line for Fusion’s Competition Screenings & Awards Ceremony is growing! Don’t miss out on our FINAL EVENT! @khorne1234 It was such an honor to have you! Chanelle Aponte Pearson speaks on the importance of being able to recognize the wealth and assets of underrepresented communities and building up from there. Shirin Neshat is an Iranian visual artist who lives in New York City, and is known for her work in film, video, and photography. Neshat's early photographic works include the Women of Allah series (1993-1997), which explored the question of gender in relation to Islamic fundamentalism and militancy. Her 2009 feature debut, Women Without Men, received critical acclaim, and she has recently completed her second feature-length film, based on the life and art of the legendary Egyptian singer Oum Kulthum. Neshat has been recognized countless times for her work, from winning the International Award of the XLVIII Venice Biennale in 1999, to winning the Silver Lion for best director at the 66th Venice Film Festival in 2009, to being named Artist of the Decade by Huffington Post critic G. Roger Denson. More below on Fusion’s relationship to the Will and Jada Smith Family Foundation! FUSION honored WJSFF and presented Will & Jada Smith Family Foundation Awards to a group of hugely talented young artists Saturday night April 7 at the Cantor Film Center at Fusion's Competition Awards Ceremony. The Will & Jada Smith Family Foundation is pleased to support the Fusion Film Festival and its work on behalf of women in the entertainment industry.